Optimize your bathroom’s square footage with this 60” x 60” corner whirlpool tub, while at the same time creating a sanctuary for one. This tub was designed with the woman of the house in mind; it has a raised seat built right in, so she can shave her legs in comfort. Mount a handheld shower on the deck to make her grooming process even easier. The ample bathing well stretches from corner to corner, giving her plenty of room to bathe in luxury, and 23 air jets will surround her with gentle, massaging bubbles that will calm her spirit and soothe her body. Eight jets provide spa-grade hydrotherapy water action. 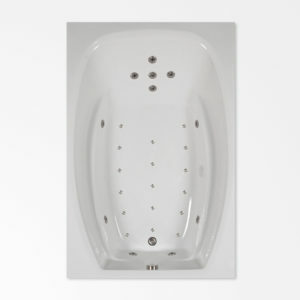 They are fully adjustable to customize the bathing experience. The tub’s surface is made of genuine scratch-resistant Lucite acrylic for enduring beauty and ease of maintenance. 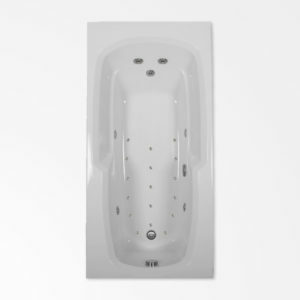 Relax in comfort in this roomy combination whirlpool/air tub and enjoy the peace of mind that comes with making a sound investment in a high-quality product of enduring beauty. Treat yourself like a queen with all the luxurious amenities built into the 60 x 60 RN combination whirlpool/air tub. Designed to slide right into a corner, this tub is specially made for one person. The molded seat, lumbar support, and head and arm rests are befitting of a throne you can sit back in and wash away the cares of running a busy life. A built-in vanity seat is the perfect perch for shaving your legs. The top deck has ample space for installing a tub filler with faucets and a hand-held showerhead, still leaving room for lush bathing products. 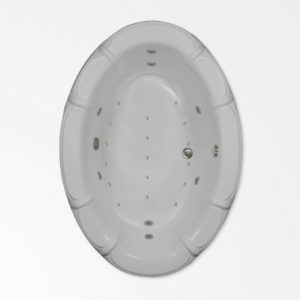 An oval bathing well adds beauty and reaches from corner to corner giving you abundant room to stretch out your legs. All this plus six whirlpool jets you can adjust for pressure and direction and 15 air injectors to get a spa-quality hydromassage at home. Need more leg room in your bathtub? The 66 x 32 EL combination tub has it. 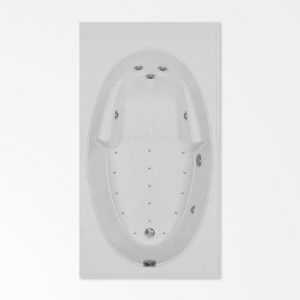 With six more inches of length than the standard 60-inch, this tub has plenty of room for you to stretch out your legs, making it the perfect choice if you’re taller than most. 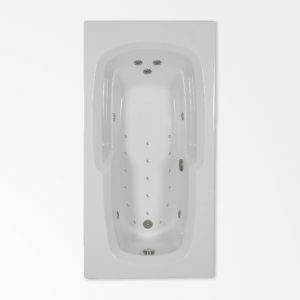 Seven hydrotherapy jets, three of them dedicated to your back and two more on each side, and 17 air injectors turn this tub into a private oasis. Adjust the hydrotherapy jets for less or more pressure and point them at just the right spot to customize a massage to your needs, while the air injectors infuse the water with millions of massaging bubbles. It has a streamlined design with a flat deck, angled tub edge, and molded armrests built in. Its rectangular shape and dimensions make it ideal for installation in an alcove with a mounted showerhead above it. Its smooth Lucite Acrylic surface makes it beautiful, easy to clean, and durable. Give yourself the room you need with the 66 x 32 EL, plus the quality and durability you deserve. Give yourself plenty of room to enjoy a long, luxurious soak in the 66 x 42 combination tub. Its extra length and width make sure you won’t feel cramped or crowded. Simple, crisp design give this tub a contemporary edge. Built-in armrests flow seamlessly into a soap ledge and follow the lines of the tub, adding comfort, functionality, and style. The tub’s deck leaves plenty of room for shampoo, conditioner, and bubble bath. 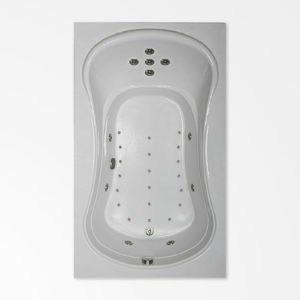 Seven whirlpool jets deliver hydrotherapy massage to your back, hips, and legs. 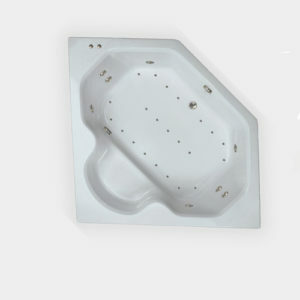 Seventeen air jets placed in the tub’s floor deliver tiny air bubbles to massage your whole body. Streamlined for simplicity and generous in size, the 66 x 42 is luxury you can afford. Do you love the intricate craftmanship of historical design styles? With its iconic oval shape and raised scallop deck detailing, the 68 x 48 Oval combination tub alludes to classical Roman architecture and will add opulence to any bathroom it graces. Install it in a custom-built island and make this tub the showpiece of your master bath. It features a deep bathing well and space for two people. 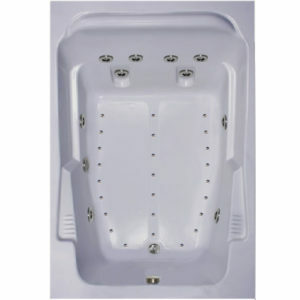 Eight spa-grade jets and 17 air injectors furnish hydrotherapy and soft tissue massage to both bathers. Choose from a variety of tub colors and hardware finishes to suit your bathroom’s design scheme. Like the architecture that inspired it, the 68 x 48 Oval is built stand the test of time. Like crown molding adds a finished look to a room, two detail lines encircling the rounded tub deck add a tailored finish to the 70 x 42 JR. The curvaceous oval form softens hard edges, while seven hydrotherapy jets combined with 20 air injectors take the edge off your day. If you’re tall, you will relish the extra length and depth this tub gives you. This roomy tub’s bathing well is unencumbered by any features that would take away from its straightforward design, making it an instant classic and easy to clean. 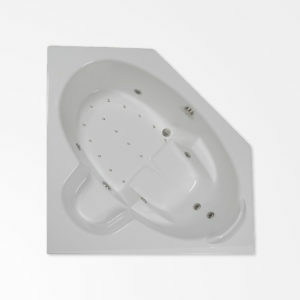 Three jets at your back and four at your sides provide therapeutic whirlpool action to your tub. 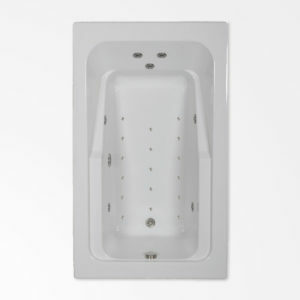 Make the 70 x 42 JR combination tub the crowning finish to your bathroom design. Slide this extra-long tub into your bathroom alcove and you’ll have ample room to stretch out but won’t be sacrificing precious square footage in your floor plan. With the 72 x 36’s curved lumbar support and molded armrests built right in, you won’t be sacrificing comfort either. If you crave the restorative benefits of hydrotherapy, the 72 x 36 has seven whirlpool jets to provide them, three for your back alone. Seventeen air injectors create effervescent water. Its rectangular deck is slightly angled to direct water back into the tub, so it is ideal for a shower/bath combination. Scratch-resistant genuine Lucite Acrylic and rigid PVC pipes make care and maintenance a breeze. The 72 x 36 combination tub will tuck neatly into your bathroom and turn it into the retreat you hope for with the quality you expect. Don’t let another minute pass before you check out the features of the 72 x 42 HG combination tub! The concave curves on the sides do more than give this tub its unique hourglass shape—they provide extra deck width, so you can install a five-piece Roman faucet set, one of our accessories that includes a handheld showerhead. Inset accent lines ride the curves of the 72 x 42 HG, highlighting its novel shape. Luxuriate in the spacious bathing well that this tub’s generous dimensions allow. A raised headrest and molded armrests furnish the comfort of an easy chair, while 11 jets amp up your bathing experience: five for your back, two for your feet, and four for your hips and calves. Adjust them to increase the water pressure for a vigorous massage or to decrease pressure for a soothing one. Add to that the soft caress of tiny bubbles aerating the water through 20 air injectors and you have the ultimate bathing experience. The soft curves of this figure eight tub are designed to wrap around two bathers and add elegant style to your bathroom. Each bather is swathed in comfort with matching lumbar supports and molded armrests. Its shape means it can be filled with less water than a traditional rectangular tub. Eight hydrotherapy jets encircle the tub walls, 17 air jets fill the tub floor and surround each bather with a premium spa experience. The rectangular deck slopes downward slightly, softening the shape of the tub and allowing water from an overhead shower to flow back into the bathing well, making it an ideal choice for a shower/bath combination. It’s beautiful enough to stand on its own in an island as well. Its 72-inch length provides plenty of room for two people, but it 42-inch width means it won’t overwhelm your space. If you’re looking for a tub that will add elegant beauty to your master bath as well as lasting value to your home, the 72 x 42 HR is the choice for you. Have a seat in the lap of luxury with the 72 x 42 RM combination tub. It has all the custom features you could ever want in a tub—a sculpted seat with lumbar curve, molded armrests, and built-in soap dishes. Plus, plenty of room to stretch out. Three recessed whirlpool jets massage your back, and four others reach your hips and legs, while 15 air jets inject the water with bubbles. The jets are spa-quality and provide you with the best in hydrotherapy massage. The plumbing is hand-formed rigid PVC pipe, so it drains completely ensuring hygienic water fills your tub. The 72 x 42 RM has a wide deck to fill with custom fixtures and decorative touches. 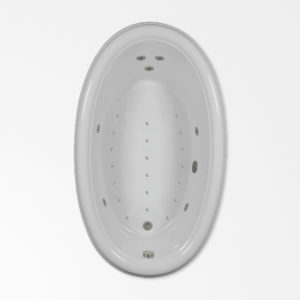 The oval well softens its look and adds classic styling. Create a posh bathing experience in your bathroom with the 72 x 42 RM. Beauty that will last a lifetime. Quality you can trust. Stop feeling cramped in your tiny tub! The 72 x 48 EW’s generous dimensions were designed with one bather in mind but can easily accommodate two. A sloping back means you can recline in comfort as you sink down into luxury. Curved armrests smoothly incorporated into this tub mirror the curved edge of the bathing well, adding bathing comfort and a touch of style. A rectangular deck means you can add custom fixtures and keep your favorite bath products on hand. The bowed side walls create more room for you to spread out. 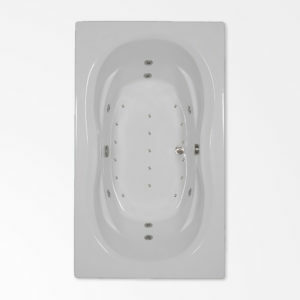 You can enjoy the healthful benefits of hydrotherapy massage any time you want with the 72 x 48 whirlpool tub. Five jets work out any muscle tension you may be holding in your back; four focus on your legs, and two target your feet. Seventeen air injectors are interspersed on the tub floor for extraordinary bubble action. Fulfill your heart’s desire for wide open spaces when you bathe by yourself or for coziness if you bathe with someone else. The 72 x 48 EW may be just the right fit for your needs. Create an escape from the pressures of modern-day life for you and your companion with the 72 x 48 combination tub. Sit side by side as the tensions of the day float away. This tub has plenty of features to recommend it for your master bathroom. Recline in comfort against the curved lumbar support and built-in headrest and armrests. Soap dishes are built-in too and have a corrugated surface to prevent soap from slipping into your bath water. A rectangular shape means it can be installed in an alcove with an overhead shower or in a freestanding island. Each bather gets a premium back massage from three hydrotherapy jets. Four more jets, two on each side, complement the water action from the back jets. Twenty-five air injectors fill the tub with aerated water to stimulate vitality. Take your partner on a mini-vacation every time you step into the 72 x 48 combination tub. Your experience will be five-star all the way.